Here's my final two squads of Corsair Reavers to finish off my 1850 points of Corsair/DE/CE list. They are converted from warriors, wyches, wood elves wild riders and dark elves corsairs. The flamers are from the fire dragons exarch. The reaver bands are trophy hunters, one specializing in vermin extermination with flamers. The others are big game hunters, going after hard targets with blasters. These are really great conversions! Where did the capes come from? Also, where did you get both right-handed and left-handed pistols? FYI, I'm pretty sure the fire dragon exarch's gun that you used is actually a fusion gun, rather than a flamer. It's the dragon breaths flamer for the fire dragon exarch. They are quite similar, but the fusion guns don't have the lip at the front, and the fuel canisters are parallel to the weapon. The capes and left arms are from the Dark Elves Black Ark Corsairs kit. The kit has 6 hand-crossbows, which I cut off and replaced with splinter pistols from the wych kit. There's a chain mail sleeve which looks kind of off, but It's not too bad. where did you get both right-handed and left-handed pistols? Probably did weapon swaps on existing arms, I did the same a while back on my exodite corsairs (mostly wych knives). I have to admit that the dark eldar bodies with elf heads look a lot less static than mine which are the other way around. 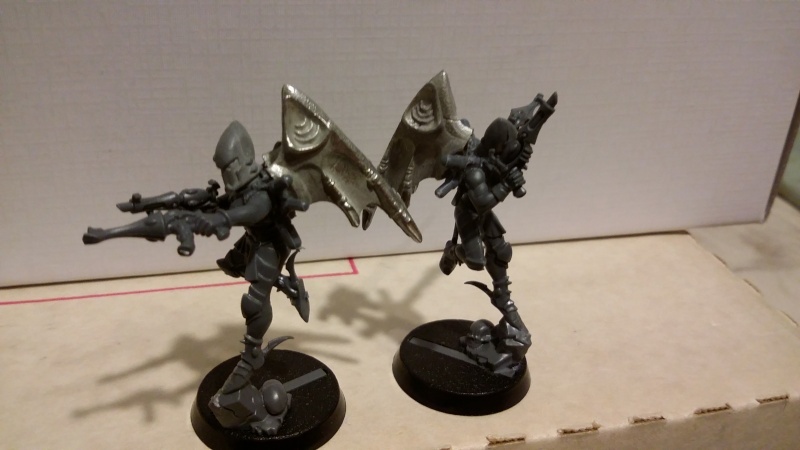 Even better if you can find/afford them though - the harlequins' shuriken pistols are left handed. Apologies for recycling old, crappy pictures... too lazy to take new ones and haven't finished painting them anyway (at this rate I may never). Have you decided on a colour scheme yet? No, I really like these conversions too. I'd probably do a mixed bag between the two. Maybe use 1 style for standard corsairs and the other style for the felarch and balestrike bands. Ultimately, I just wish dissonance pistols worked on vehicles so I'd have a reason to make my corsair army. Well those look fantastic i'm definitely stealing a fair amount of that for my exodite counts-as kabalites. I am also going to shamelessly steal most of this. I assume you used Wych legs in the second picture (of the first post)?